OUE C-REIT will see DPU declining. Back in 2014, when OUE C-REIT had its IPO, I warned that its gearing was too high and its distribution yield (which was financially engineered to be higher through income support given by the sponsor) was too low given its IPO price of 80c a unit. 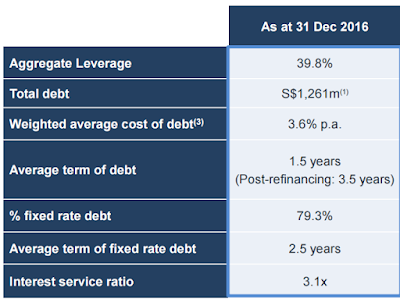 The IPO was a good deal for OUE Limited. Investing in REITs, we should be prepared for fund raising because they distribute most of their income to their investors. When a REIT raises funds, we have to question their reason for doing so. If it is to invest in yield accretive assets, it is a good thing. Regular readers of my blog would be familiar with the argument that not all rights issues are bad. REITs and rights issues: Dilutive or not? In this instance, OUE C-REIT is placing out new shares at 64.3c a unit (which is some 20% lower than its IPO price) in order to strengthen its balance sheet. So, there will be no additional income from this exercise. In fact, DPU will most certainly decline since there will be more units in issue while income stays the same. The REIT's 4Q 2016 DPU was 1.18c. This is a 9.36% reduction from a DPU of 1.26c in 4Q 2015 and this is after contribution from One Raffles Place which was acquired in late 2015 too. OUE C-REIT has about 1,300,000,000 units in issue. Placing out around 233,000,000 units to strengthen its balance sheet will see some savings in interest expense but the REIT's DPU is likely to decline further. Roughly, we could see interest expense reducing some $5 million per year or $1.25 million per quarter. While distributable income will increase by a similar quantum, in percentage terms, we will see about an 8% increase. Now, put this against an 18% increase in units in issue and do the math. Math is not my strongest subject but I think we will see quarterly DPU declining to less than 1.1c which means less than 4.4c for a whole year. Just to put this in perspective, at the REIT's IPO, DPU was 5.44c. Therefore, to get the same distribution yield as what was offered during its IPO, OUE C-REIT's units should trade at a much lower price compared to its IPO price. About 20% lower which means a unit price of 64c. Of course, we want to remember that without income support for OUE Bayfront, the REIT's DPU would be even lower. This income support will expire end of 2018. Coupled with new supply of office space which will worsen the excess supply situation in the CBD, OUE C-REIT is on a slippery slope. So, demanding an even lower price than 64c a unit before investing in OUE C-REIT is not unreasonable but whether Mr. Market is willing to sell at a lower price is anyone's guess. For anyone who is interested in reading more of my thoughts on OUE C-REIT and, specifically, why I avoided it, please see the related post below and its comments section. OUE C-REIT (12 Jan 14). See OUE C-REIT presentation (26 January 2017): HERE. Singapore, June 12, 2015 -- Moody's Investors Service says that OUE Commercial Real Estate Investment Trust's (OUE C- REIT, Ba1 stable) proposed acquisition of an effective interest in One Raffles Place will increase its asset base significantly and add diversification to its portfolio. However, the trust will need to fund the acquisition with an equal proportion of debt and equity to keep its financial metrics within the parameters of its Ba1 rating. "Upon completion of the acquisition, OUE C-REIT's asset portfolio will more than double in value and its total net lettable area will increase significantly," says Jacintha Poh, a Moody's Assistant Vice President and Analyst. "The trust's asset and income diversification will also improve." OUE C-REIT's reliance on its largest asset, OUE Bayfront — which accounted for 69% of its total asset value at 31 March 2015 — will fall to around 33%, once the acquisition completes. Moody's expects that if the acquisition is successful, the gross rental income contribution from OUE Bayfront will fall to approximately 40% from the 68% maintained during the period starting from the trust's listing date of 27 January 2014 until 31 December 2014. While the acquisition will increase OUE C-REIT's asset concentration in Singapore to 85% from 69% at 31 March 2015, One Raffles Place is a good quality and strategically located asset that will strengthen the trust's competitive position as a landlord in the Singapore office market. In addition, the increase in gross revenue contribution denominated in Singapore dollars will reduce the impact of foreign exchange fluctuations from its ownership of Lippo Plaza in Shanghai. 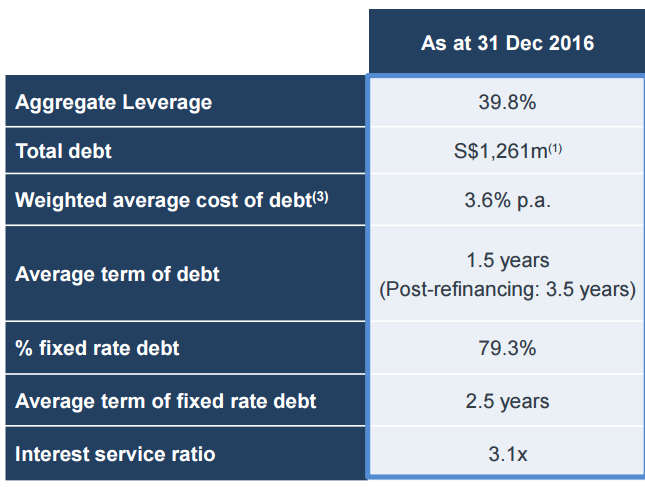 As of 31 March 2015, OUE C-REIT's adjusted debt/total deposited assets stood at 38% and its adjusted EBITDA interest coverage ratio was at 4.4x. OUE C-REIT announced on 10 June 2015 that it would acquire an effective interest of between 61% and 68% in One Raffles Place through the indirect acquisition of a 75% to 83% interest in OUB Centre Limited (OUBC, unrated). OUBC is the registered owner of One Raffles Place, and owns an 82% stake in the property. Mr. Gordon Tang ceased to be a substantial shareholder after selling 12.2 million units according to a filing by the REIT on 21 February 2017. Mr. Tang still holds more than 64 million units in the REIT after the sale.